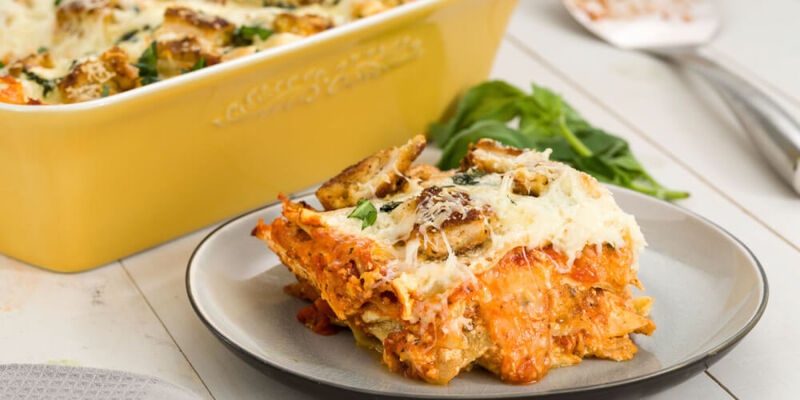 Although you might be more familiar with beef lasagne, this chicken lasagne recipe is very tasty too. You only need chicken, lasagne sheets, stock, cheese and pasta sauce to prepare it and it can be served with anything from garlic bread to a simple green salad or your favourite vegetable. If you have leftover chicken, that will save some time. Simply shred it or pull it apart into chunks, then proceed with the recipe. This lasagne takes 45 minutes to bake in the oven, and it's ready to serve when the cheese is golden brown and melted and it's piping hot through. Let it sit for 10 minutes though because it will be extremely hot. 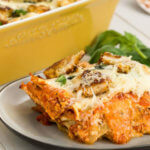 This chicken lasagne recipe makes a great weeknight dinner. You could even prepare it in the morning then simply pop it in the oven when you get home. If you're doing that, check the temperature in the middle before serving in case it's not hot enough. 1. Put the chicken in a pan and cover with enough water to cover. 2. Bring to a boil and cook for 20 minutes or until no longer pink in the centre. 3. Discard the water and shred the chicken with 2 forks or using your fingers. 5. Dissolve the stock cube in the hot water. 6. Stir the chicken with the stock, cream cheese and half the mozzarella. 7. Now spread a third of the pasta sauce over the base of a 30 x 20cm baking dish. 8. Add half the chicken mixture, then 3 lasagne sheets. 9. Repeat these layers and top with the rest of the sauce and cheese. 10. Bake for 45 minutes then serve hot.